Against the Current on Grand Avenue in St. Paul will be offering 20% off everything in the store and $25 gift certificates for $20 both Friday and Saturday. At Beagle and Wolf Books and Bindery in Park Rapids, all books listed in the store’s holiday catalog will be 20% off, and the store will be open until 8:00 p.m. There will be hot cider and cookies for shoppers starting at noon, and Beagle and Wolf will again be participating in Park Rapids’ Yuletide Sampler, which begins at 5:00 p.m. and has local businesses running specials and handing out treats in the run-up to the 6:00 tree lighting. At the Bookstore at Fitger’s in Duluth, everyone who makes a purchase on November 23, 24, or 25 will earn an entry into a drawing for the giant moose in the store’s window. You earn an additional entry for each $50 spent. You can also get a coupon for 15% off in the store’s holiday catalog, available now. Buffalo Books and Coffee in Buffalo is having a 20% off sale on almost everything in the store (including coffee beans) and will be open extended hours, 6:30 a.m. to 7:00 p.m.
At Chapter2Books in Hudson, Wisconsin, mention this article to get 20% off any book in the Midwest Holiday Catalog! Content Bookstore in Northfield will open one hour early (9:00 a.m.), and right after opening there will be a fireside talk from the store’s Random House sales rep presenting some gift ideas. There will also be free coffee and donuts on hand for shoppers. At DreamHaven Books and Comics in Minneapolis, all bagged and collectible paperbacks on the sales floor will be 50% off (does not include showcase or behind-the-counter books). Drury Lane Books in Grand Marais will be having its annual holiday sale Friday, Saturday, and Monday, with 15% off storewide. 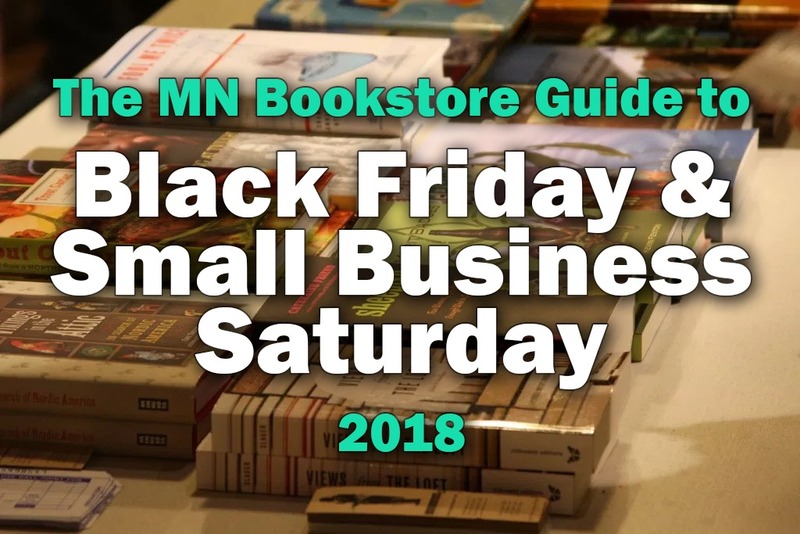 Fair Trade Books in Red Wing will have cocoa and coffee available for shoppers, and the town’s annual Holiday Stroll is also happening from 3:00 to 9:00 p.m.
Lake Country Booksellers in White Bear Lake will be offering cookies and discounts to shoppers all day. At the Little Professor Book Center in Owatonna, games are 25% off, and everything else in the store except magazines is 20% off. Magers & Quinn in Uptown Minneapolis is celebrating Plaid Friday with a promotion for locals: show your ID or a piece of mail with a Minneapolis address it and you’ll get a free Magers & Quinn decal (while supplies last). Milkweed Books at Open Book in Minneapolis will be running a free “take a book, leave a book” exchange and offering special three-book bundles curated by authors Hanif Abdurraqib, Peter Geye, Bao Phi, and Amy Thielen (prices range from $50 to $65 and represent about 20% off individual list price for the books). Be among the first to sign up for the bookstore’s new limited-edition perks for sustaining members—donation of $5 to $25 per month—including an enamel book pin, a coffee mug featuring poetry by Ada Limón, and a tote bag featuring a quote from Braiding Sweetgrass. And finally, visitors can also contribute to the “What do bookstores mean to you?” gallery wall display. At Red Balloon Bookshop on St. Paul’s Grand Avenue, you can drop off your little geeks, ages 3 to 12, to have fun at the store’s “Deck the Halls Holiday Workshop” while you get some shopping done. Walk-ins will be accepted as space allows, or you can register in advance. Sweet Peas and Back Forty Books in Two Harbors is kicking off its Book Extravaganza sale this weekend, with hundreds of books priced from $1 to $2—as items are sold, more will be continually added. Christmas decorations are also 50% off as part of the store’s discontinuation of its home décor section. At Turtle Town Books and Gifts in Nisswa, all Melissa & Doug books will be 20% off. Valley Bookseller in Stillwater is open 9:00 a.m. to 8:00 p.m. and offering a special deal through December 24: buy $100 in gift cards and get a $20 gift card for free. The first 25 customers will also get a $5 gift card with purchase both Black Friday and Small Business Saturday, and there will be a Magic Scratch ornament giveaway for kids. The Village Bookstore in Grand Rapids will be running promotions yet to be announced. Call or watch the store’s Facebook page for updates. Against the Current in St. Paul will be offering 20% off everything in the store and $25 gift certificates for $20 both Friday and Saturday. Beagle and Wolf Books and Bindery will have Indies First tote bags and refreshments on hand and will be giving away a free book with any purchase while supplies last. The store is also hosting authors Frank Weber (The I-94 Murders) and Noel Allard (Minnesota Aviation History 1857–1945). Buffalo Books and Coffee will have drawings and in-store specials and is hosting local author Tom Hegg for a book signing from 10:00 a.m. to noon. Chapter2Books in Hudson, Wisconsin, will be giving away copies of Ghost by Jason Reynolds while supplies last. At Cherry Street Books in Alexandria, cookbooks and children’s hardcover picture books are 20% off, and games are 25% off. (Note: This sale has already started and will be going on through the weekend.) The store will also have its weekly story hour at 10:00 a.m. Content Bookstore in Northfield will be giving away a free Content mug with purchases of $100 or more. There will also be coffee, donuts, and giveaways throughout the day. At Daybreak Press Global Bookshop on the U of M’s East Bank, all children’s books and select other titles will be 20% off. You can also get a free tote bag with a purchase of $30 or more, and there will be donuts and coffee for shoppers. DreamHaven Books and Comics in Minneapolis will be running a number of promotions: all bagged and collectible paperbacks on the sales floor are 50% off, as on Friday; back-issue (bagged) comics on the sales floor are 50% off; all of the store’s quarter-bin comics are 10 cents each all day; and there will be yet-unspecified sales on graphic novels, children’s books, and other promotions. Click here for more details and exclusions. 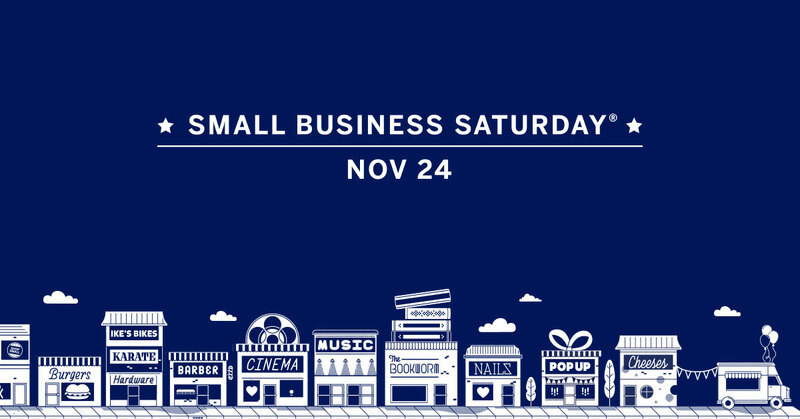 Driftless Books in Wabasha will be running door prizes and drawings for Small Business Saturday. Drury Lane Books in Grand Marais continues its annual holiday sale (Friday, Saturday, and Monday) with 15% off storewide. Excelsior Bay Books in Excelsior will be hosting Mikaela Casey, author of Lenny the Loon: An Adventure on Lake Minnetonka, from 1:00 to 3:00 p.m.
Fair Trade Books in Red Wing is hosting local author Elizabeth Verdick (Small Walt and Mo the Tow) from 11:00 a.m. to 2:00 p.m. and will have crafts available for kids to do in-store. As on Friday, Lake Country Booksellers in White Bear Lake will be offering cookies and discounts to shoppers all day. At Magers & Quinn, the first 100 customers to spend $50 or more will receive a $10 gift card for their next visit. You can also win totes, pins, and other prizes by answering local and literary trivia questions. Micawber’s Books in St. Paul’s St. Anthony Park neighborhood is hosting three local authors: David LaRochelle and Mike Wohnoutka from 11:00 a.m. to 1:00 p.m. and C. M. Surrisi from 1:00 to 3:00 p.m. There will be complimentary cider and cookies while they last, and customers who buy $100 in gift cards will receive a $20 gift card free. At Milkweed Books at Open Book in Minneapolis, get a free $10 gift card when you buy one for $50 or more, plus get a free tote bag with the purchase of three books or more. As on Friday, you can pick up one of the store’s special three-book bundles curated by authors Hanif Abdurraqib, Peter Geye, Bao Phi, and Amy Thielen (prices range from $50 to $65, representing about 20% off individual list price for the books). There will also be discounts on select other titles and free coffee and treats while you shop. Click here for details and updates. Note that Tellabration 2018, an event featuring free discussions, classes, and workshops related to storytelling, is also going on all day Saturday in the Open Book building. Red Balloon Bookshop on St. Paul’s Grand Avenue will be hosting authors Drew Brockington, Rick Chrustowski, Megan Maynor, Melanie Heuiser Hill, Alison McGhee, and Kelly Barnhill as guest booksellers throughout the day. Click here to find out who will be there when. SubText Books in downtown St. Paul will have snacks and refreshments on hand for Small Business Saturday shoppers. Sweet Peas and Back Forty Books in Two Harbors is kicking off its Book Extravaganza sale this weekend, with hundreds of books priced from $1 to $3—as items are sold, more will be continually added. Christmas decorations are also 50% off as part of the store’s discontinuation of its home décor section. Valley Bookseller in Stillwater is open 9:00 a.m. to 8:00 p.m. and is offering a special deal through December 24: buy $100 in gift cards and get a $20 gift card for free. The first 25 customers will also get a $5 gift card with purchase both Black Friday and Small Business Saturday, and there will be a Magic Scratch ornament giveaway for kids. Finally, the store will be hosting local author Elizabeth Verdick (Small Walt and Mo the Tow) at 10:00 and the creator of Cubles activity toys at noon. At Wild Rumpus Books for Young Readers in Minneapolis, the store’s new tote bags (featuring artwork by local artist and Wild Rumpus bookseller Heather Albinson) will be 20% off—and those bags are good for a 20% discount on all future purchases. Local musicians Nicholas Jordan and Michael Keyes will also be playing live music from 1:00 to 4:00 p.m.
Zenith Bookstore in Duluth will be giving away free tote bags to the first 50 customers and offering cider, cookies, and sales all day. The store is also hosting signings by local authors and illustrators Jonathan Thunder (Bowwow Powwow), 11:00 a.m.–12:30 p.m.; Tony Dierckins and Pete Clure (Naturally Brewed), 12:30–2:00 p.m.; Leif Enger (Virgil Wander), 2:00–3:30 p.m.; and Katie Berg (North Shore Adventures), 3:30–5:00 p.m.
Also keep in mind this list doesn’t include Minnesota’s many great comic shops, such as Comic Book College, High-Class Comics, Mead Hall Games and Comics, and more. And plenty of other businesses are having promotions this week, including many of the dropoff locations participating in the Twin Cities Geek Holiday Toy & Book Drive!